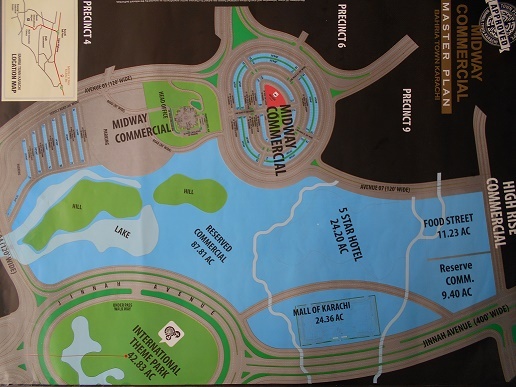 Midway commercial area is ideally located right next to International Theme Park just along Precinct 4, Precicnt 6 and Precinct 9. There are two blocks of Midway commercial namely Block A and Block B. Block A is starts after the Theme Park whereas Block B starts after the Headoffice of Bahria Town Karachi. Currently these commercials are selling at high profits. Especially the area opposite to headoffice in B block and the area next to theme park with large parking in A block is selling at more than 1.5 crore profit. Other normal location plots are selling at 70+ lacs profit which is quite high in such a short period. However, there is still much more room for growth in Midway as constructions have not started yet. Should you require more information regarding Midway Commercial area, feel free to contact us via email or phone numbers given at contact us page.